For over 60 years, the Metropolitan Vacuum Cleaner Co., Inc. (Metrovac) has been creating and manufacturing its line of vacuum cleaners that have revolutionized the industry with powerful cleaning abilities combined with practical features like portability and high efficiency. Since the 1980’s, Metrovac has engineered and manufactured dog grooming dryers and has become an international leader in the dog grooming market. High quality and efficiency are Metrovac’s cornerstones. Metrovac’s Air Force Commander Dog Grooming Dryer is one of the top dog grooming tools that professionals and non-professionals alike turn to for drying their short-haired dogs’ fur without using heat that dries out their coats or makes them uncomfortable. The Air Force Commander is a combination of portability with highly efficient drying that gives you the power and speed of a large, commercial dryer with the compact design and ease of use of a portable machine, cutting drying time for short-haired dogs by two-thirds. 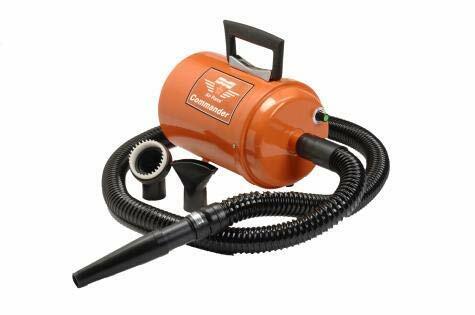 If you offer mobile dog grooming services or just want to spend less time grooming your pets, the Air Force Commander Dog Grooming Dryer features several attachments like an air concentrator, air flare tool, and a groomer rake that give you excellent results in far less time than other dryers. An extra long cord (12 feet) lets you plug in almostanywhere, includes a Bonus Velcro Cord Wrap to neatly store, and the 6 foot hose gives you ample room to move around the dog to get hard-to-dry places. Variable Speed airflow lets you customize the drying experience for small dogs and large dogs alike, and the portable dryer can be used on the floor or table top, depending on the size of the dog. • Size: 12" x 7" x 7"